#11/12 Terriers begin their final weekend of first semester with a visit to Yale’s Ingalls Rink and a meeting with the #15 Elis. The game begins at 7 p.m. and can be seen online on ESPN3. The teams met last March in the opening round of the NCAA tournament with BU emerging with a 3-2 win on Danny O’Regan’s overtime goal. The Terriers have a 7-0-2 record in their last nine games against Yale with five of the last six going to overtime. Yale (5-4-2) is led by senior Stu Wilson and freshman Joe Snively with eight points apiece, while three other skaters have six points. Junior Alex Lyon is once again among the top goalies in Division 1, bringing a 1.76 GAA and a .932 save percentage into the game. BU’s depth on defense will be challenged as Brandon Hickey is away at Team Canada’s Junior National Team selection camp and captain Matt Grzelcyk is unlikely to play due to a setback in his recovery. O’Regan leads the team in points with 19, while Ahti Oksanen (photo) has a team-best eight goals. Jakob Forsbacka Karlsson and Brandon Fortunato, who each have 15 points, round out the top four scorers for BU. ► The first episode of BU Terriers All Access, a new show dedicated to Boston University men's ice hockey which debuted on NESN last night, can now be seen online here. BU has a third commitment for its 2019 class, right-shot defenseman Case McCarthy. A native of the Buffalo suburb of Clarence, N.Y., the 6’0”, 185 lb., blueliner is in his second season with the Mississauga Rebels of the Greater Toronto Hockey League minor midget AAA division. 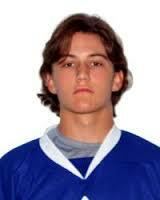 Case McCarthy (01) commits to Boston University. Defenseman & NY kid who plays with the Top 2001 team in Ontario: The Mississauga Rebels. Poised, smart righty defender who plays beyond his years (and looks it). A good facilitator in possession who doesn’t force plays and salvages misplayed pucks when possible. Showed what could be a great offensive upside here and produced a lot. We hadn’t watched him super close – did not realize he was a 2001 until the end. Going into this season, GTHL Canada listed McCarthy as one of the league’s top prospects for the 2017 OHL draft. ►2016 recruit Dante Fabbro heads to Ontario for the World Junior A Challenge, which begins Dec. 13. The right-shot defenseman, who will skate for Canada West in the tournament, has 38 points in 24 games for the Penticton Vees. 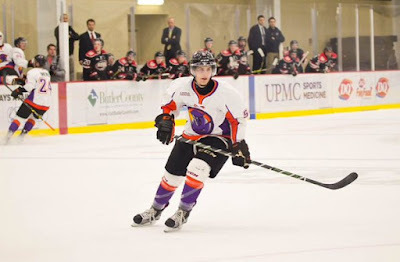 ► 2016 recruit Vas Kolias scored his third goal of the season in Youngstown's 5-4 shootout loss to the Chicago Steel. 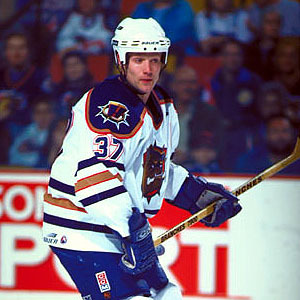 Three former Terriers will be included in the 2016 class for the Maine Sports Hall of Fame: Jack Kelley, who coached at Colby College before his decade at the BU helm; Doug Friedman (photo), a 104 point career scorer who captained BU’s national finalist squad in 1993-94 and now is head coach and AD at Kents Hill School; and Travis Roy, whose BU career ended after just 11 seconds due to a tragic injury and has become an author, speaker and fundraiser for spinal cord injury research and survivors.